I equate Labor Day with the end of summer and, also, a time to get together with family and friends to enjoy some delicious food and drinks before the weather changes for most of the country. So, it did not come as any surprise to me that Sunday Supper has teamed up with Gallo Family Vineyards to give you some great ideas for this year’s holiday. When I was younger, I loved eating orange creamsicles. They are kind of like a popsicle but creamy and packed with orange juice. Chances are that when I was growing up it wasn’t quite ‘fresh squeezed’ but the color and flavor were there, so I was happy. Fast forward and I still love creamy orange desserts, sauces and drinks, but now I use the actual fruit. You can only imagine my excitement when Gallo Family Vineyards launched their new Riesling at the Food and Wine Conference last month. I already knew that I had been selected as a blogger for today’s Sunday Supper event, and that they were introducing a new wine that would be featured today; but didn’t know it was their Riesling. I found myself having a tough time passing on ‘just one more’ glass of this perfectly chilled white wine that is loaded with honeysuckle, juicy peach, pear and ripe citrus, including my beloved oranges. When I came home from the conference I received my glorious box of wines from GFV. The Riesling was one option and their fabulous Sweet Red was the other, packed with flavors of red fruit, black cherry and raspberry jam. It was the lure of the oranges that, ultimately, inspired me the most…at least for today. 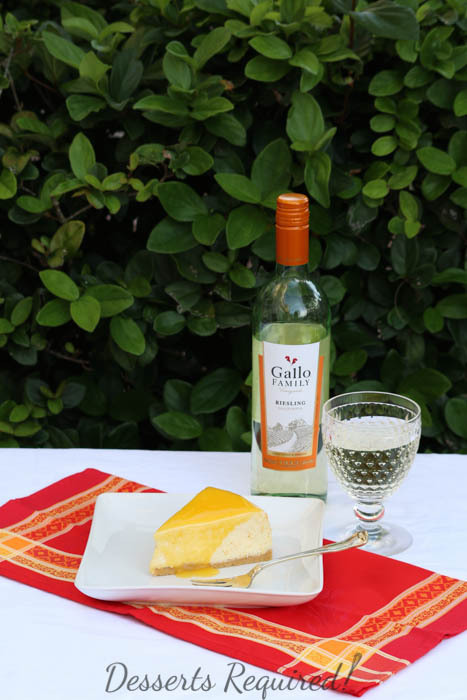 I decided to make an Orange Creamsicle Cheesecake, because it works so nicely with the Labor Day theme and it complements Gallo’s Riesling so well. 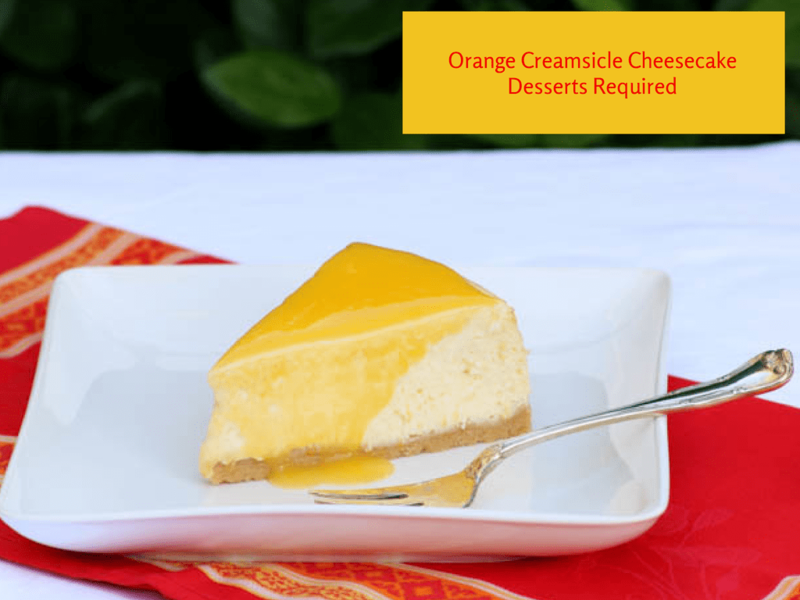 I really wanted to incorporate oranges throughout the Orange Creamsicle Cheesecake. 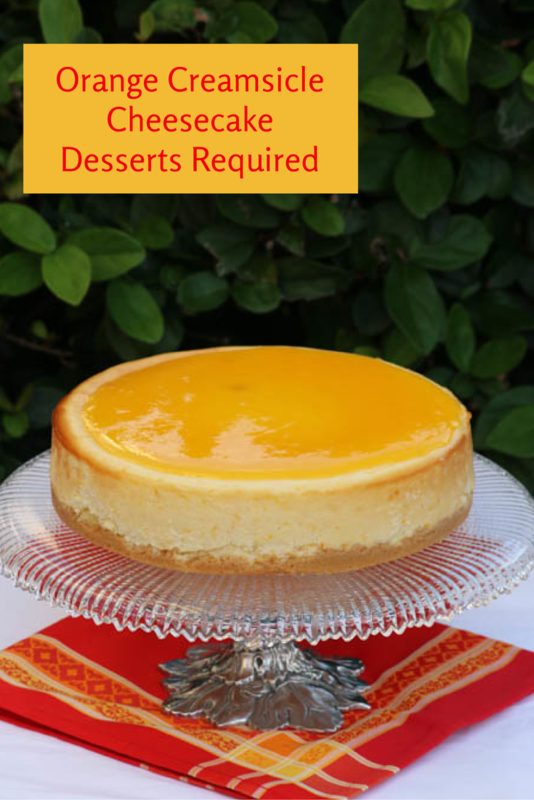 Orange zest was added to the shortbread crust, orange zest and juice were added to the creamy cheesecake filling and the topping is straight orange juice boiled with a bit of sugar and arrowroot/water to thicken. Actually, I was having a bit of trouble with my topping so I reached out to my dear friend and brilliant pastry chef Jenni Fields. 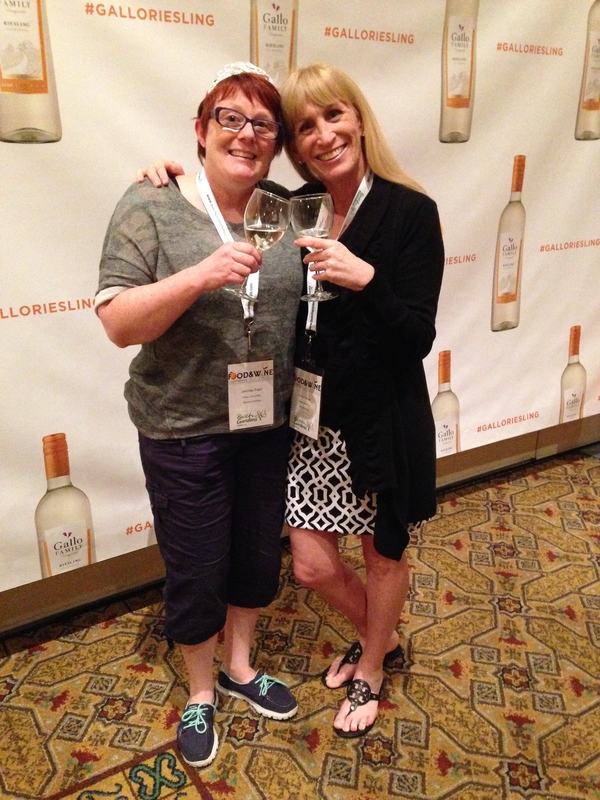 I, finally, got to meet Jenni in person at the Food and Wine Conference and am so happy that I have this great picture of the two of us standing in front of Gallo’s sign at the Riesling premier. This Labor Day, don’t be too sad that summer is coming to an end…especially when you can finish your festivities with a gorgeous Orange Creamsicle Cheesecake. Trust me, your family and friends will thank you. Preheat the oven to 325°. Spray a 10” round springform pan with nonstick spray. Line the bottom of the pan with parchment paper and set aside. Place the cookies, sugar and orange zest into a food processor fitted with a metal blade. Process until the cookies are a fine crumb. Add the melted butter and pulse on/off until the butter mixed into the cookies. Transfer the crust to the prepared pan and spread evenly onto the bottom of the pan. Bake at 325° for 10 minutes. Set aside. Place the cream cheese and sugar into a large mixing bowl. Beat until the mixture is light and fluffy, about three minutes, scraping the bowl down as needed. Add the eggs, one at a time. Blend in the orange juice and zest. Pour over the crust. Bake at 325° for 50 minutes. Remove from the oven and cool completely. Remove the side of the springform and refrigerate the cheesecake for several hours or overnight. Place the orange juice, sugar and arrowroot/water into a small saucepan. Cook until the sauce is thickened, about 5-8 minutes. Cool for 15 minutes. Pour the topping onto the cheesecake, starting in the middle and working your way to the outside, leaving a little bit of a rim of cheesecake showing. Refrigerate to set, about 1 hour. Using a long metal spatula as your guide, slide the cheesecake off the bottom of the pan and onto a serving plate. The cheesecake may be frozen once it has cooled but before the topping has been added. Defrost the cheesecake in the refrigerator before topping. The topping is not very thick so don’t worry if some of it drips down the individual cheesecake slices. Additional time is needed for the cheesecake to cool and, also, for the topping to set. Are you interested in some fabulous Labor Day recipes? No worries…GFV has got you covered with these wonderful recommendations. Additionally, GFV offers a store locator, so you know exactly where you want to go. Don’t forget to get your $1 off coupon, as well! Don’t forget to follow GFV on Facebook, Twitter, Instagram and YouTube. Many thanks to Isabel from Family Foodie for hosting this week’s Sunday Supper event. Be sure to check out all of the other wonderful Labor Day entertaining options that pair so perfectly with Gallo Family Vineyards Riesling and/or Sweet Red wines. My husband enjoys orange creamsicle shakes and cheesecake so I’m sure he would really enjoy this dessert. You are such a dessert whiz… this cheesecake looks gorgeous! I’m not a huge orange creamsicle fan, but even this makes me want to dive right in! I was just showing my mom your creamsicle cheesecake photos and telling her about the recipe, Betsy. Her comment: “Some people are so creative!” I could not agree more! You made my day! That is the sweetest thing. Please tell your mom I send my thanks to both of you! Gallo’s Riesling is my new favorite ever since the Food and Wine Conference. I would happily eat a slice of this great looking cheesecake with a glass. Cheers! I am with you on this. I fell in love with this wine at the Food and Wine Conference, too! You are on! I can’t wait to dig in to your White Wine Ice Cream!! What a yummy flavor combination for a cheesecake – I am loving it! So beautiful, so delicious! Love your recipe!!! What could possibly be tastier than a creamsicle than creamsicle-flavored cheesecake! This looks amazing, and it would pair beautifully with the new Riesling. Yum!! Thanks so much. 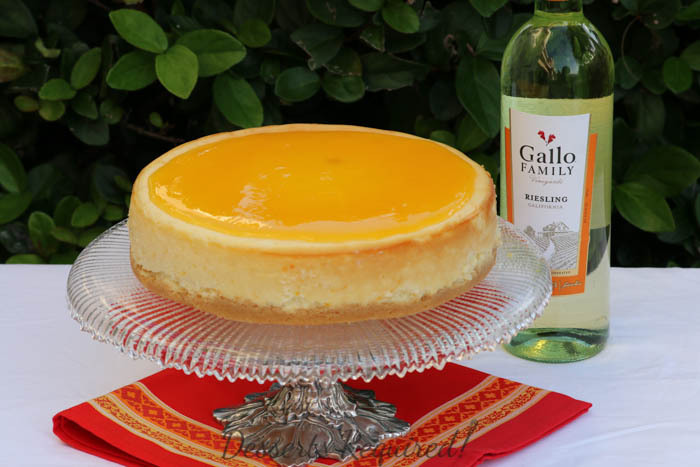 It’s almost as if Gallo Family Vineyards had this cheesecake in mind when they created their delicious Riesling! This makes me so happy. I think today’s post is really about chatting about fond memories. Thanks so much for your lovely words and shares! you’ve definitely got me craving a slice of this cheesecake right now. never tried an orange flavoured cheesecake, i am curious to know what it tastes like! Thank you. If you ever had an orange creamsicle ice cream pop, the taste is kind of like that but better because everything is fresh!! What a gorgeous cheesecake! And I love your video! Thanks so much! I, greatly, appreciate the video love! I am dreaming of this dreamsicle – I am hoping it will arrive at my table for #SundaySupper dessert. If it does not make it there in time, come on down here instead! My son just asked me to buy dreamsicles yesterday! He would go nuts if I made this dreamy cheesecake (therefore I will not show him the photos) ;). Seriously mouthwatering, Betsy. This is such a perfect dessert for summer! It looks beautiful!! What a great end of summer dessert! I honestly can’t think of a better pairing for the Gallo Riesling than this cheesecake. What a perfect pairing! I haven’t made a cheesecake in years, but my hubby is SUCH a big fan of all things orange creamsicle. And geez, that reminds me, his birthday is coming up in a few weeks. This might be making an appearance! Won’t this be a fun addition to the AMAZING meal I know you will make hubby??!!?? Thank you so very much for you lovely words. 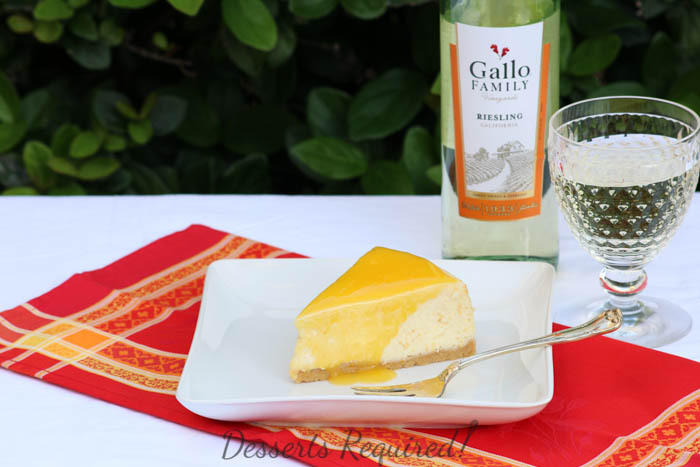 Gallo’s Riesling is heavenly with this cheesecake! Thanks so much!! I am sooooo glad! Funny as Israel is famous with it’s oranges. Thanks so much. I bet it will be delicious with fruit kissed from the Israeli sun! Looks divine. Can I make this ahead of time and freeze it? Will it lose any of its flavor or texture? Thank you. I would make and freeze the cheesecake but hold off topping the cake until just before serving. Yum Yum send me some by mail to Toronto lol I love Cheesecake any kind! Arrowroot starch is from the arrowroot plant which grows in tropical climates. Substitute cornstarch or potato starch for it, if you prefer.